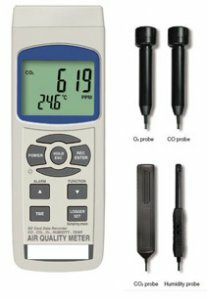 Air quality is important for productivity, safety and achieving optimum settings on ventilation and fresh air entry in HVAC control systems.This is an economical solution for determining base conditions and the effects of changes in control settings. Accuracy is sufficient for this purpose and the kit is supplied with sensors and carry case - just add an SD card up to 16Gb capacity. Data is transferred to a PC on the SD card and can be analysed directly using a standard spread sheet program. load to the Excel, extra software is no need. CO2 range : 0 to 4,000 ppm x 1 ppm. O2 range : 0 to 30.0 % x 0.1 %. CO range : 0 to 1,000 ppm x 1 ppm. Humidity range: 10 to 95 %RH. Dew point : -25.3 to 48.9 C. C & F selectable. Temp. range : 0 to 50.0 C. C & F selectable. CO2 sensor : NDIR, long term reliability. 10. CO, O2 sensor : Galvanic cell type. 12. Alarm setting with the beeper sound output. 13. Sampling time for data recorder is 2 seconds to 8 hours. main meter and the hard carrying case. 15. Meter can cooperate with 2 GB to 16 GB SD card, SD card is optional.